Aristophanes was the greatest of the writers of the original Greek comedy, which flourished in Athens in the fifth century B.C.E. , and the only one with any complete plays surviving. He wrote at least thirty-six comedies, of which eleven still exist. 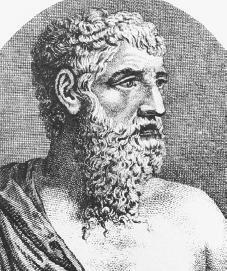 Aristophanes was born in Athens between 450 and 445 B.C.E. into a wealthy family. He had an excellent education and was well versed in literature, especially the poetry of Homer (eighth century B.C.E. ) and other great Athenian writers. His writings also suggest a strong knowledge of the latest philosophical theories. All of Aristophanes' boyhood was spent while Athens was one of the two leading Greek political powers and the center of artistic and intellectual activity. Between the ages of seventeen and twenty-three Aristophanes began submitting his comedies for the annual Athens competition. His easy humor and good choice of words made most laugh and at least one politician take him to court. Whatever punishment resulted was mild enough to allow Aristophanes to continue his clever remarks at the leader's expense in his forthcoming comedies. Aristophanes' special touch with comedy is best explained with a look at the original Greek comedy. The original Greek comedy, Old Comedy, was a unique dramatic mixture of fantasy, satire (literary scorn of human foolishness), slapstick, and obvious sexuality. Aristophanes used beautiful rhythmic poetry as the format for all of his comedy. He had a way of shrinking the self-importance of people involved in politics, social life, and literature, but above all he used his unlimited amount of comic invention and high spirits. In one such comedy, The Knights, Aristophanes represented the local Athenian leader as the greedy and dishonest slave of a dimwitted old gentleman (the Athenian people come to life). The slave is his master's favorite until displaced by an even more rude and nasty character, a sausage seller. At the time the featured politician was at the height of his popularity, yet Athenian tolerance even in wartime allowed Aristophanes first prize in the competition for comedies. All of Aristophanes' comedies kept pace with the political climate of Athens. In peacetime he wrote an emotionally charged and rude celebration of favorite things to do during peacetime. In times of Athenian plots and prewar conflict, he wrote his own conspiracies, such as Lysistrata, a depiction of the women of Greece banding together to stop the war by refusing to sleep with their husbands. With such a plot the play was inevitably rude but Lysistrata herself is one of his most attractive characters, and his sympathy for the difficulty of women in wartime makes the play a moving comment on the foolishness of war. 430 B.C.E. , killing many. As Athens faced her worst enemy—starvation—Aristophanes' comedy continued to be crisp and cutting. Frogs received the first time honor of the request for a second performance. The long war finally ended, when the Athenians were starved into surrender in the spring of 404 B.C.E. This sad defeat broke something in the spirit of the Athenians, and though they soon regained considerable importance both in politics and in intellectual matters, they were never quite the same again. In the sphere of comedy the no-holds-barred rudeness of the Old Comedy disappeared and was replaced by a more cautious, refined, and less spirited New Comedy. The political climate was uneasy with the Spartans lording over Athens. Aristophanes had to hold his tongue in his plays, no longer poking fun at leaders and politics. He died nine years after Lysistrata, which still exists, and three years after his play Plutus. Dates of death range from 385–380 B.C.E. but it is certain that Aristophanes died in his beloved city, Athens. Bloom, Harold, ed. Aristophanes. Philadelphia: Chelsea House, 2002. David, E. Aristophanes and Athenian Society of the Early Fourth Century B.C. Leiden: E.J. Brill, 1984. Russo, Carlo Ferdinando. Aristophanes, an Author for the Stage. New York: Routledge, 1994.